It’s been a long time coming but finally – the blog that’s devoted to blushers, bulldogs and banana bread, actually has a post about banana bread. Momentous day! Another cold Sunday saw me staring at a mountain of chores and work to catch up on. So, what did I do? Naturally, I found something to bake. I spied a bunch of perfectly ripe bananas in the kitchen and anticipating their slow descent into mush over the coming week, I thought I’d speed the process along by spending a couple of hours transforming them into the perfect wintery treat: a warm, meltingly delicious loaf of banana bread. Nigella’s had it pretty rough in the last couple of weeks but whatever you think of her, I don’t believe anyone could deny that the cookbooks she created are flippin’ marvellous. 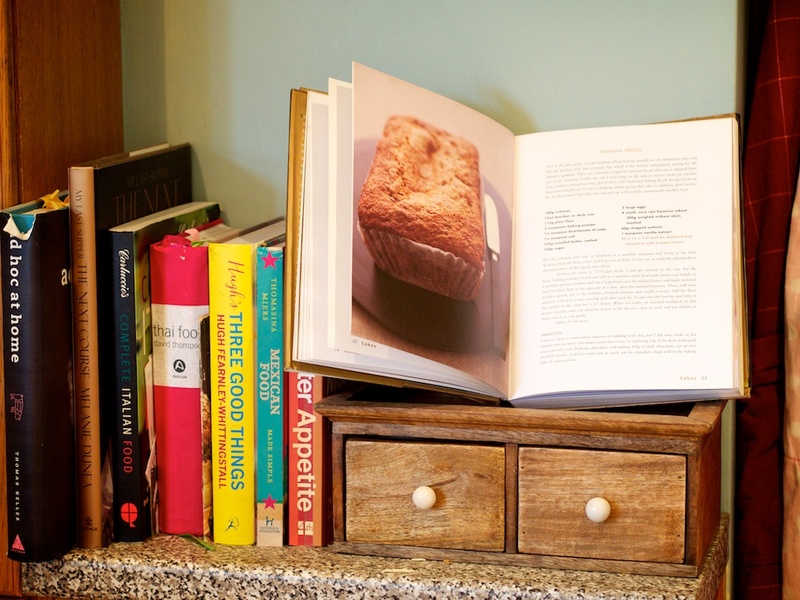 This recipe’s from How to be a Domestic Goddess – though once again, my ill-prepared storecupboards resulted in a little free-form re-writing.